But this is one time when errors do not matter - for this is Second Life, a 3D virtual world where characters can create their own scenarios. 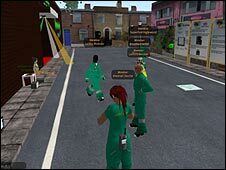 Paramedic students at St George's Hospital, University of London and Kingston University use Second Life to aid their learning. In the virtual world they can treat patients by checking a pulse, dressing wounds and administering drugs. They can also access a toolkit, including all the equipment typically found in an ambulance, such as oxygen masks and an electrocardiogram (ECG) to test electrical activity in the heart. After assessing and treatment the 'patient' at the scene, students have to decide how to get the patient into the ambulance and then set a GPS device to take them to the hospital where they hand over the patient notes - which are then emailed to a real-life tutor for feedback. Dr Ahmed Younis, principle lecturer, said that as well as providing a fun and novel way of learning the course, believed to be the first in this country, was also a valuable aid allowing students to practise newly learnt skills in a safe environment. "The most important thing is that they can afford to make mistakes online, which they could not afford to do in real life. "When they make a mistake, they are always keen not to make this mistake again." And Dr Younis said 90% of students who tested the system said Second Life had aided their learning and would help them handle real-life cases more smoothly. James Lafferty, a second year paramedic said: “Although it is not better than going out on the road it is the next best thing. "Everything you do has a consequence. So if you want to give a certain drug and you do it wrong it can result in something bad. "It is a very good way of learning. I find it a lot better than sitting down and reading notes." "As second years we have now all had all had a little experience on the road, but we thought that if we had the chance to use it earlier in our training it would have helped." Students face five scenarios, including a suspected heart attack in a tube station. Each week they are emailed a Second Life URL, which will takes them directly to a scene, where they will encounter a mannequin who needs their help. Emily Conradi, e-Projects Manager at St George's, said the course was proving invaluable. "Paramedic students spend a lot of time in work placements, which can be based anywhere in the country, so it can be hard for them to meet face-to-face with each other and with their tutors. "The advantage of Second Life is that it feels more real. "Students get a sense of being there together and can decide what to do from what they can see in front of them." The e-learning unit now plans to expand Second Life lessons to students on a range of other healthcare courses such as midwifery and physiotherapy.